OTTAWA, Canada -- Ukraine wants Canada to offer to send peacekeepers to the country’s war-torn east, hoping a commitment from Ottawa would prod others, like the European Union. 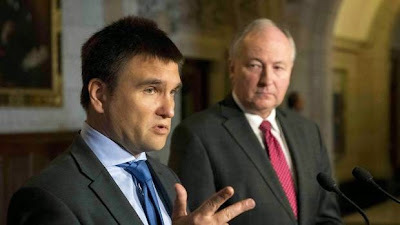 Pavlo Klimkin (L), Ukraine's Minister of Foreign Affairs, speaks at a joint press conference with Minister of Foreign Affairs Rob Nicholson on Parliament Hill in Ottawa on Thursday, April 30, 2015. Mr. Klimkin came to Ottawa with praise for Canada’s commitment to his country, which has included more than $400-million in aid, and military trainers. Ukrainian foreign minister Pavlo Klimkin came to Ottawa with praise for Canada’s commitment to his country, which has included more than $400-million in aid, and military trainers. Now Mr. Klimkin wants Canada to champion the Ukrainian call for an international peacekeeping mission and offer to take part. Earlier this week, the EU rebuffed Kiev’s request for peacekeeping troops, offering instead to send a civilian assessment team. Mr. Klimkin said Canada could encourage the EU to reconsider by offering its own peacekeepers to work alongside Europeans in an “open” mission. Mr. Klimkin said in an interview with The Globe and Mail. “I told my friend and colleague, Canadian Foreign Minster Rob Nicholson, it could be an EU open mission. Many EU countries would be deeply reluctant to send peacekeeping troops to Eastern Ukraine, where Russian troops are reportedly aiding separatist rebels who control much of the provinces of Donetsk and Luhansk. Russia opposes such a mission, saying both the rebels and the Kiev government would have to agree. Mr. Klimkin insists it will be crucial. An international mission is in Ukraine now – the Organization for Security and Co-operation in Europe is monitoring the cease-fire set out in the oft-violated Minsk agreements – but a civilian-military peacekeeping mission will also be needed, he said. “Who is going to be responsible for stabilization in Donetsk and Luhansk? For preparing for free and fair elections? For disarmament?” he said. But so far, the European Union is unwilling, and Ukraine’s request for a UN peacekeeping mission is likely to be blocked by Russia’s security council veto. Still, Mr. Klimkin said the Europeans have at least recognized stabilization efforts will be needed. He would like Canada to press the idea. In addition, he said, Canada should help beef up the OSCE monitoring mission. “We need more Canadians in that,” he said. A spokesman for Mr. Nicholson, who appeared at a press conference with Mr. Klimkin earlier in the day, did not comment. Mr. Klimkin said Canada has been “the” supporter of Ukraine, providing help without months of debate. Military and technical aid is crucial for bringing Ukrainian troops up to modern standards after their capacities degraded under the previous government, he said. Ottawa has also pledged $400-million in assistance. Mr. Nicholson on Thursday pledged another $14-million for rule-of-law programs, including $8-million for a program to combat human trafficking of children. “Maybe, many here in Canada simply believe it’s a number of symbolic steps for Ukraine, that it’s helpful, but at the end of the day, it’s not crucial,” he said. Ottawa has also joined the United States and the EU in imposing sanctions on Russia, and has turned diplomatic relations with Moscow chilly. But one of Mr. Harper’s predecessors, Jean Chrétien, met with Putin in Moscow on Thursday. The InterAction Council, a group of former world leaders, said last week Mr. Chrétien is collecting information for its June discussion on relations between Moscow and the West. Mr. Klimkin said it is fine for people to use their “personal connections” to engage with Moscow as long as it does not undermine foreign-policy messages. And Chrétien should also be making Ukraine’s case, he said. “For me, what is critical is that in talking to the Russians or engaging with the Russians, everyone plays by the rules, and not trying to have separate tracks which are different from co-ordinated and agreed positions,” he said.